Criminal Tax Attorney Naperville - Don’t Hire An Inexperienced Audit Attorney! 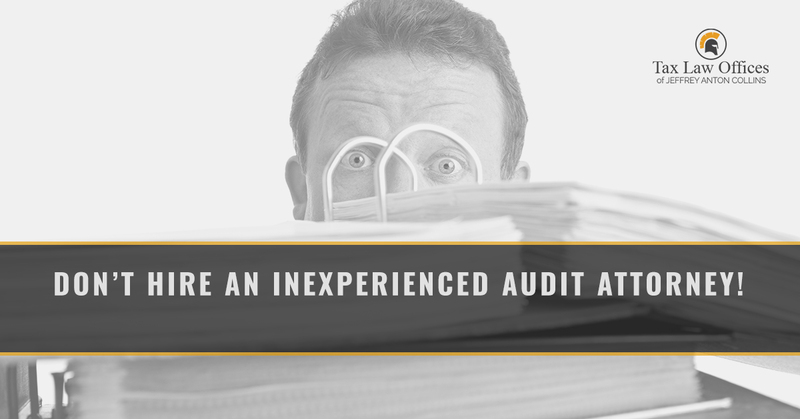 Don’t Hire An Inexperienced Audit Attorney! It’s daunting to receive a letter from the IRS stating that you owe money or that you have not filed your taxes. As you read through the letter, a sinking feeling hits your stomach and you start asking yourself, “how will I pay for this?” You may even collapse to the floor and begin crying. But a glimmer of hope flickers in your mind. You remember filing. You return to your records and retrieve the confirmation that you owed less than what’s on the IRS letter. As you review your records, you realize that you’re supposed to be getting a refund. What happened? At Tax Law Offices in Naperville, we understand if tax season is the most stressful time of the year for you, especially if the IRS is filling your mailbox with letters. In most cases, the IRS is efficient and reliable; however, they do make mistakes. In some cases, they may pursue you for money you don’t owe. Remember that you have rights. Your lax liability should not be more than determined by the law. So, when you get threats from the IRS about garnishment or penalties, you need to hire a criminal tax attorney immediately. It’s imperative you have an attorney fighting for you to get the best possible outcome. In this post, we’ll share the dangers of hiring an inexperienced criminal tax attorney, how it can affect your life, and how a great tax attorney can actually help you resolve your conflict with the IRS. An inexperienced tax attorney will do their best to accommodate your needs, but they may not be knowledgeable enough to know which questions to ask and which questions to avoid. When it comes to dealing with the IRS, an attorney should make it easier to resolve the situation, not harder. If you’re forced to answer questions that don’t matter or cause discomfort, you won’t want to cooperate with the attorney. Granted, dealing with the IRS is uncomfortable, but your attorney shouldn’t make you feel worse about it. Incorrect information on IRS paperwork can cause heaps of problems. An inexperienced tax attorney is more likely to make mistakes or not ask enough questions to get accurate information in the first place. Dealing with the IRS can be a long, drawn-out process. It’s exhausting in most cases. There is a system in place, but it’s not intuitive or user-friendly. In the midst of a tax audit or other potential criminal charges, it can be easy for an inexperienced tax attorney to feel overwhelmed and rushed to protect your interests. This can lead to missing items that can benefit your entire case. If your current audit is not taken care of properly, you could be put on the radar for a future audit — even though you would never make the same mistake twice. The peace of mind associated with not being watched by the IRS is invaluable. You can relax and live your life without worrying about whether or not you’ll need to hire another criminal tax attorney. An improper petition could prevent you from appealing the audit altogether. In essence, this means you’re finished before you even get started. An inexperienced tax attorney has an increased chance of making this mistake, which can ruin your chances of getting out from under the microscope of the IRS with your dignity,and your money, intact. An experienced criminal tax attorney is worth every dime. Your IRS situation will be dealt with in a timely, orderly fashion. Your stress levels shouldn’t go through the roof when you seek out assistance in your fight with the IRS. In fact, you should be less worried when in the capable hands of an experienced tax attorney. Don’t waste valuable time: call your Top Rated Local® tax attorney in Naperville today!